Tutorial-5 Bike 2 | Clockmender's Blenders & More! I have altered the rig to have IK chains for front and rear suspension, added a second tilt bone to pitch the bike forwards (braking) or backwards (wheely) in addition to the sideways lean of the bike. I have also added anchor points for the IK targets of Erkinator’s arms, so they stay on the handlebars as the bike steers. I parented Erkinator’s Armature to the bike’s pitch bone to keep him in place. Other movements of Erkinator are done with keyframes on his various bones. Bone steer-track is parented to root, inherits scale and rotation and has a Damped Track constraint to the empty parented to the target plane. Bone bike-lean is parented to root, inherits scale and rotation and has a Driver on it’s X axis var * -3.4 where var is the Z rotation of steer-track. 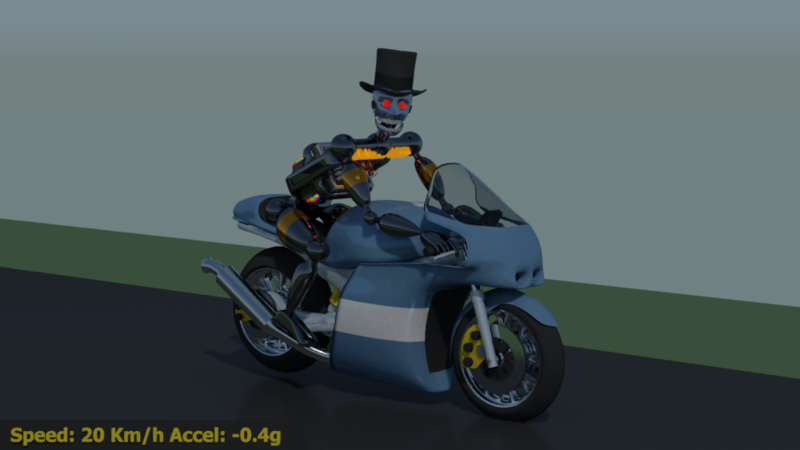 Bone bike-pitch is parented to bike-lean and inherits scale and rotation. Bone swing-arm is parented to bike-lean and inherits scale and rotation. Bone rear-stroke is parented to bike-lean and inherits scale and rotation. It has an IK constraint with rear-IK as the target and a stretch value of 1, chain length is 1. Bone rear-IK is parented to swing-arm and inherits scale and rotation. Bone rear-cyl is parented to rear-stroke and inherits rotation, NOT scale. Bone rear-piston is parented to rear-stroke and inherits rotation, NOT scale. So, bike-lean tilts the bike over in corners, bike-pitch pitches the bike forwards or backwards for wheelies/braking, swing-arm rotates the swinging arm and operated the rear shocker. The top of the rear shocker is bone parented to rear-cyl and the bottom is bone parented to rear-piston. Bone steer-control is parented to root and inherits scale and rotation and has a Driver on its Z axis var * 1.5 where var is the Z rotation of steer-track. Bone fork-top is parented to bike lean and inherits scale and rotation, it has a Driver on its Z axis var * 1.5 where var is the Z rotation of steer-track. Bone fork-IK is parented to steer-control and inherits scale and rotation. Bone fork-stroke is parented to fork-top and inherits scale and rotation, It has an IK constraint with fork-IK as the target and a stretch value of 1, chain length is 1. Bone fork-low is parented to fork-stroke and inherits rotation, NOT scale. So, if the bike is going around a corner, both steer-control and fork-top will rotate the same amount, this will pull fork-IK around as well. This action will compress the forks a small amount to keep the front wheel in the right place on the road. If the bike pitches forward or backward by tilting bike-pitch the front forks will be expanded or contracted, again keeping the front wheel where it belongs and the top of the forks where they belong. The top of the forks and handlebars, etc are bone parented to fork-top, the wheel, lower forks, mudguard, etc. are bone parented to fork-low. Additionally two empties; hand-left and hand-right – these could also be bones, but this is just my way, are parented to fork-top and are used to keep the rider’s hands in the right place. 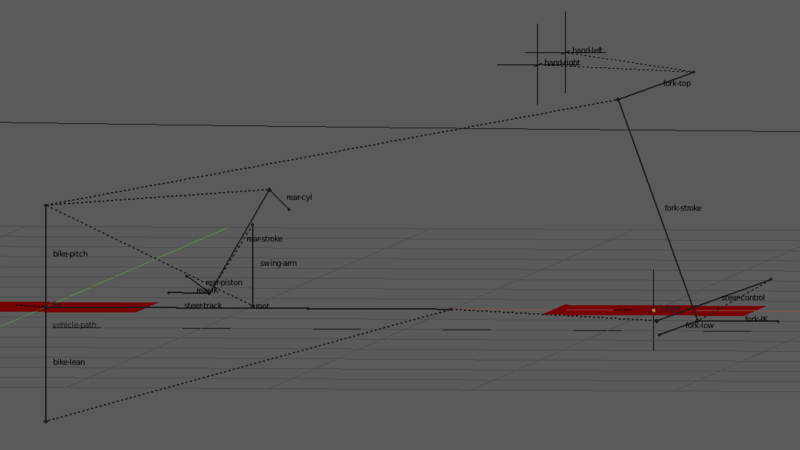 This is the really clever automation bit, it can of course be omitted altogether and you could use keyframes instead, but it is all fed by the acceleration of the bike and uses my own Bone nodes to operate the various bones. If you don’t have my Bone nodes, you must use empties, etc instead and then use Copy Transform constraints for the various bones targeted to the empties controlled by Animation Nodes as here. 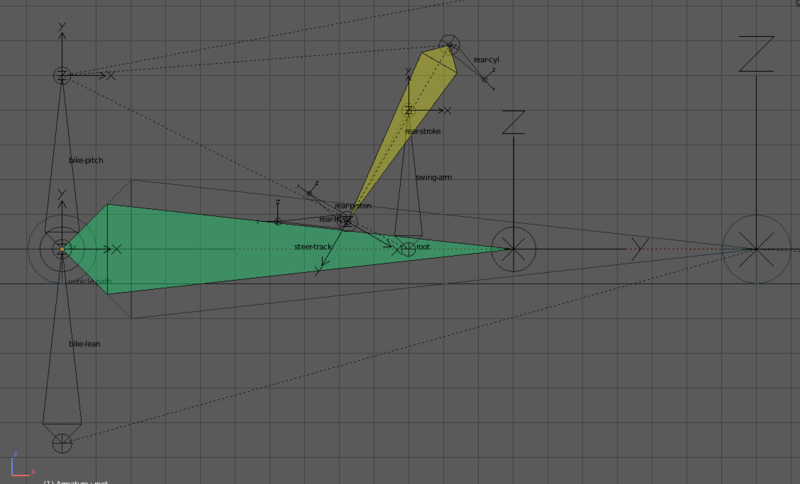 I make use of Math nodes to get the right amount of bike pitch, etc. for the given acceleration and then use Clamp nodes to control how much movement I will allow, so if the bike pitches beyond a certain value in braking, the bike will come off the floor, by raising the root bone, thus raising the rear wheel in the air whilst keeping the front wheel on the road. Similarly in acceleration, if the pitch goes beyond a certain value, the fork will stop expanding and the front wheel is raised off the road. The swing arm bone is also controlled to allow the rear suspension to expand or contract as the bike pitches. He is lying flatter on the bike and the front wheel is lifted a little, he is also just getting his foot back on the footrest. Finally, another consideration is to set the lean angle, not only based upon the steer angle, but also feed some speed component into it as well. If I take a certain radius bend at 30 mph then at 60 mph I will have to lean the bike further the faster I go, until I fall off of course! 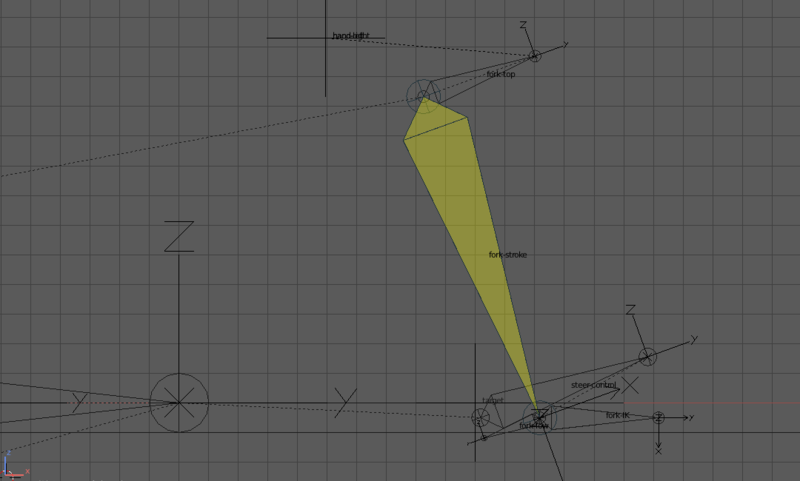 So I might add a speed component into the bike-lean angle driver to make it more realistic. I ride a large motorcycle – a Honda CB750, so I know what should happen, he said with some reservations. One thing that bike riders do not do is allow their eye-line to go much beyond horizontal, so the height of your left eye above ground is never much different to the height of your right eye, otherwise you are extremely liable to motion sickness. also riders shift their weight around on the bike to ease cornering, acceleration and braking. I have added a driver to his head bone, to keep the eye-line correct – the driver is this: var * 3.5 where var is the Z rotation of steer-track. 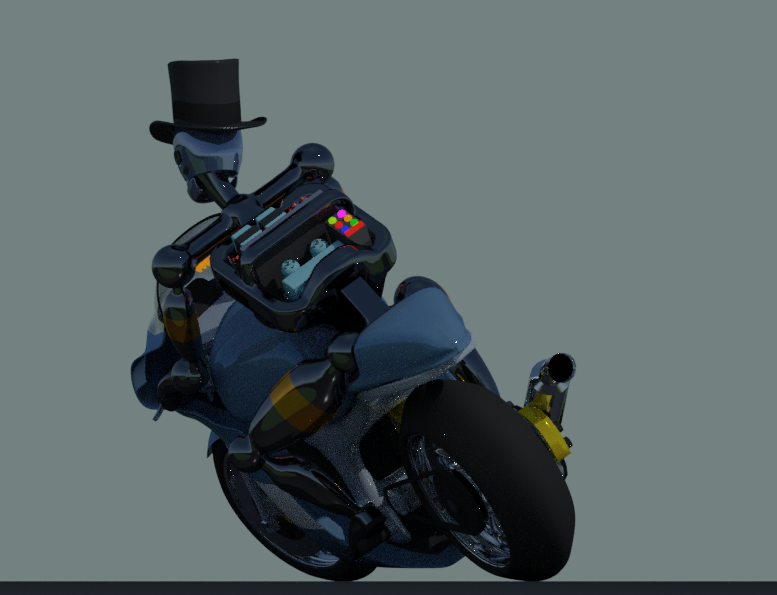 I made it slightly less than the lean angle of the bike so his head is not perfectly horizontal, just close to it for realism. So, we must try to do the same with our rider. 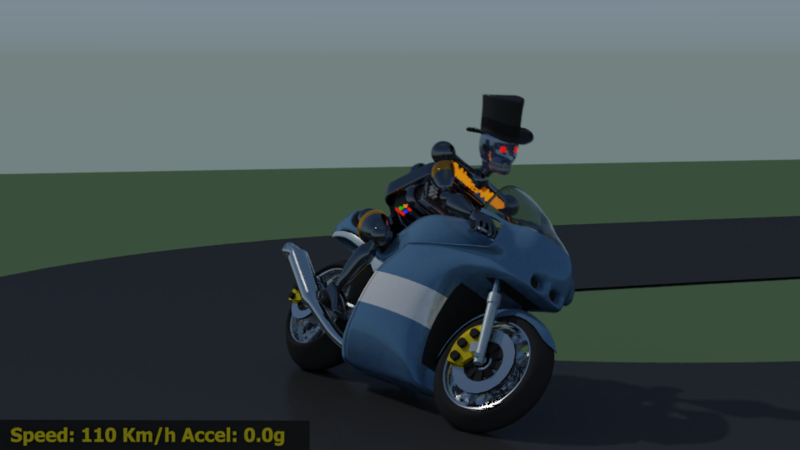 The first thing I did was to parent the rider’s armature to the bike-pitch bone, so his backside stays where it should be, but of course I can still move his relative position by keyframing. 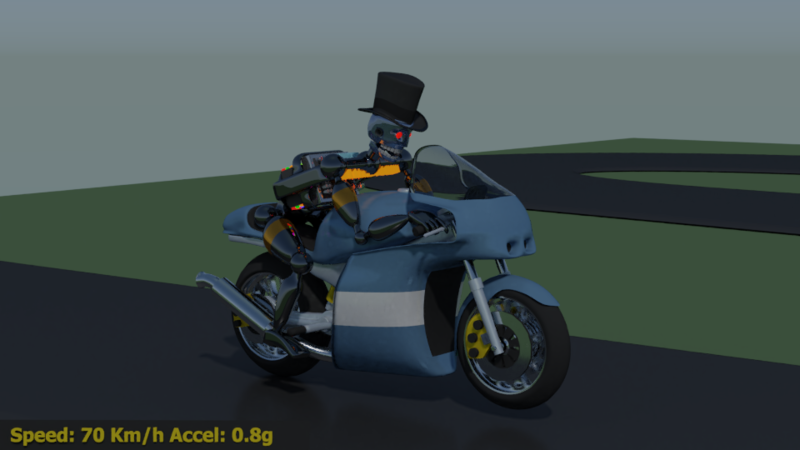 Then I added Copy Location constraints to his arm IK Target bones so they follow the empties I described above, this keeps his hands on the handlebars when cornering. I can then keyframe movements of his back when braking/accelerating so he sits upright, or tries to lie flatter on the bike. I can also keyframe portions of his leg IK Target bones to put his feet on the road, or on the footrest. I have also keyframed positions of the IK Pole Target bones so he puts his knees out when cornering, next I will also add some movement of his right wrist so he turns his hand to operate the throttle on the right handlebar – all the things that make the rider look more convincing. var * -2 * var_s where var is the Z rotation of the steer-track bone and var_s is the Z height of a new Empty that is driven in it’s Z direction by the speed of the bike. 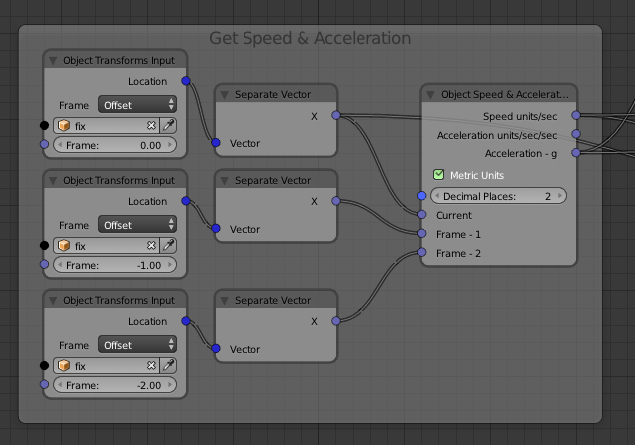 This is done in Animation Nodes using an Object Transforms Output node fed by my Speed & Acceleration node. This reduces the lean from the steer component and adds in a lean based on the speed of the bike, so the faster it goes on any corner the more it leans, this formula makes sure the bike is upright if the speed is 0, as it should be. I cannot upload the blend file I used to do this on my site (WordPress won’t allow it), but it is HERE on the BlenderArtists thread.